Comprehensive study of the contribution and influence of European actors working in Hollywood, from the earliest days of the American film industry. 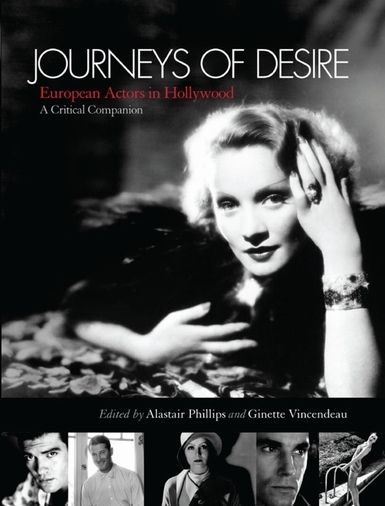 Journeys of Desire: European Actors in Hollywood offers for the first time a comprehensive critical guide to European actors in American film, bringing together 15 overview chapters with A-Z entries on over 900 individuals in one accessible and scholarly volume. Since the early days of the US film industry, European actors have consistently been a major force in Hollywood. Screen idols such as Charlie Chaplin, Greta Garbo, Marlene Dietrich, Charles Boyer, Audrey Hepburn, Maurice Chevalier, Arnold Schwarzenegger and Antonio Banderas, as well as scores of more modest players, have profoundly shaped 'American' cinema. They have also contributed to the propagation of European types and stereotypes such as the 'Russian' and Nordic queens played by Garbo and Dietrich, the French roués popularised by Chevalier, the fiery Latinos depicted by Banderas and the British arch-villains played by Steven Berkoff, Anthony Hopkins and Tim Roth. Films such as Casablanca (1942), Gigi (1958), Green Card (1990) and Vanilla Sky (2001), among many others, would not be the same without them. Contributions from a team of 70 international experts provide groundbreaking case studies of prominent individuals and phenomena associated with the émigrés such as the retired Russian officers who played crowds in silent films, the stereotyping of European actresses in 'bad women' roles and the ultimate irony of Jewish actors playing Nazis. Individual entries chart the careers and screen performances of the European actors – from Victoria Abril to Mai Zetterling – who appeared in American movies.